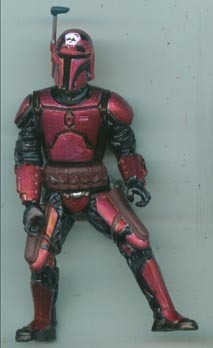 When Hasbro made thier Mandalorian 14 pack, they included the Madalorian Groom figure that I made. Unfortunatly they used a normal red helmet, while the artwork depicted a cool skull emblem on the front. When I repainted my custom of that figure into Epo, I kept the skull helmet, as Epo's helmet is the same as the one Hasbro made. I plan to swap helmets once the set is released.